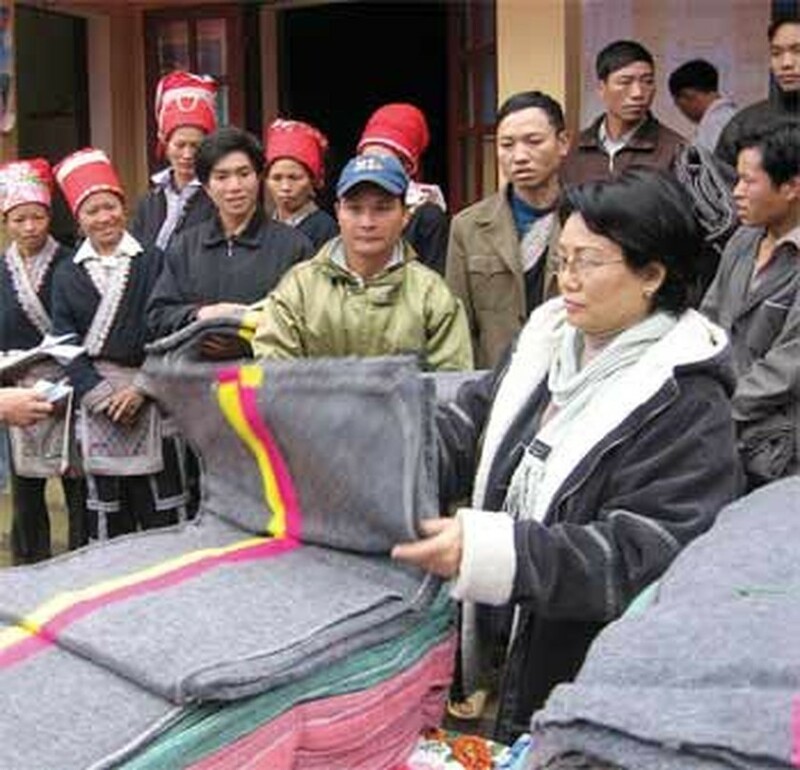 A charity mission of Sai Gon Giai Phong (SGGP) arrived in the mountainous northern provinces of Ha Giang and Lao Cai to provide VND206 million (US$16,000) in assistance to poor families whose cattle died in the chill that swept the north recently. The money is part of the proceeds of “Dong Thoi Gian” (Course of Time). Next time, a school will be build using Dong Thoi Gian funds. More than 1,898 cattle and 743.5 hectares of rice were destroyed in the cold spell, Senior Lieutenant-Colonel Hau Van Ly, deputy head of Quang Binh District Police Station, told the mission. Of 195 households that live below the poverty line, 186 were struck by the bad weather last month. It took three hours to get to the villages Thin, Mang, and Minh Tien because of steep hills and twisting roads. 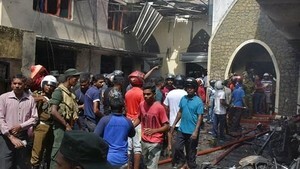 The residents of these three villages were the hardest hit. The sights here are depressing as nobody stays at home are even children must help their parents do farm work in thin and shabby clothes despite a temperature at 4°C. Ms. Ly Thi Them of Mang thanked the mission for giving her blankets and a sum of money which she will spend on rice for her remaining ox. Mr. 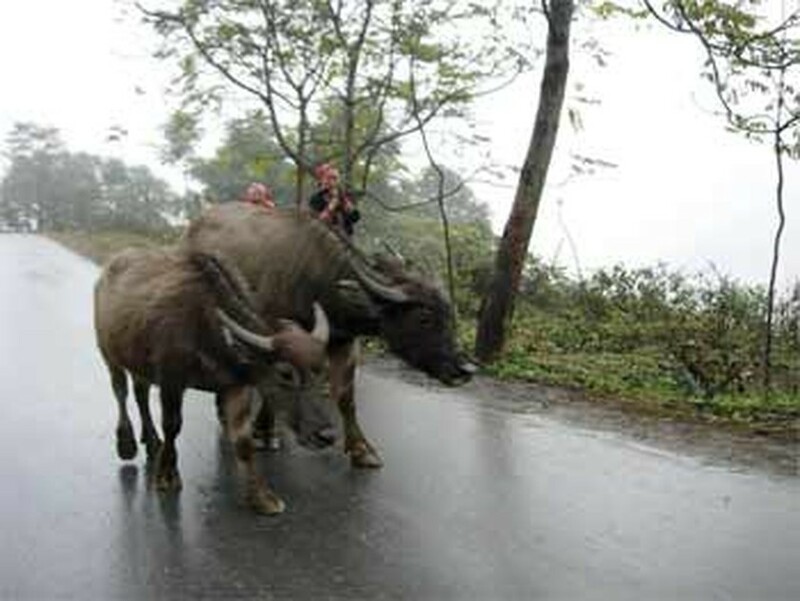 Sung A Lenh shivered when he heard that in next cold spell his buffalo calf may die and he asked how to save its life. Others have similar concerns. Local authorities have provided 10 kilograms of rice and one kilogram of salt to make porridge for weak cattle. Residents here have sweet potatoes and keep rice for their cattle. A group of pupils in Mang village plucked some leaves for their cattle on the way to school. They put the leaves in their backpacks while photographs were taken. At a house on a hill, a small thin calf ate until nothing was left in its porridge pot. The mistress of the house looked happy upon receiving VND200, 000 from a Sai Gon Giai Phong reporter. She hugged her small calf and said something to him. It may be that she told the calf that he is going to have a new porridge pot. The charity mission gave 2,800 blankets and VND240,000 to residents. On behalf of the residents, Mr. Ly thanked the enterprises and benefactors who contributed to the ethnic minority people and help them overcome their difficulties.